To prepare every scholar for success in college and the world beyond. Blackstone Valley Prep (BVP) Mayoral Academy is a network of tuition-free public schools (a 501 (c)(3) nonprofit) chartered by the Rhode Island Department of Education. As a growing network that is part of the Charter School Growth Fund portfolio, BVP offers a high-quality public school choice to the families of Central Falls, Cumberland, Lincoln, and Pawtucket and currently serves nearly 2,000 scholars in grades K-­12 across six schools. Over the years we have received thousands of applications for our limited number of seats. 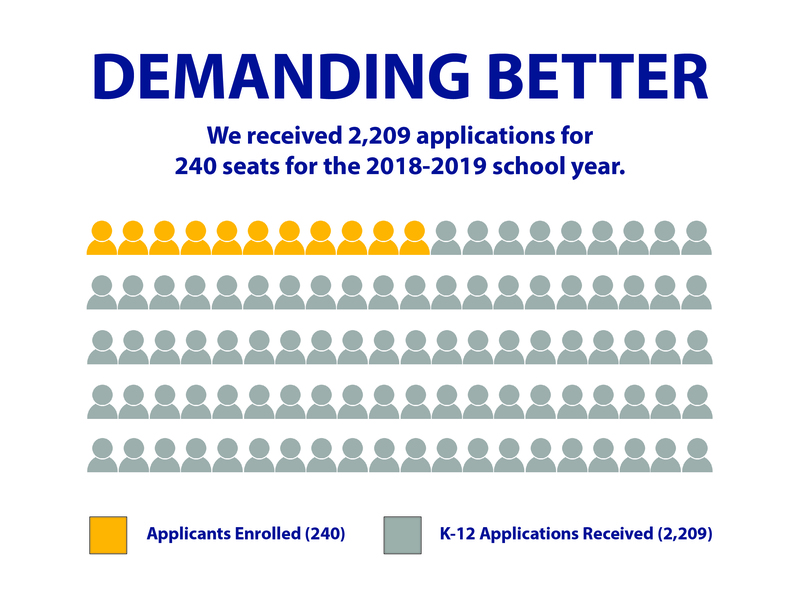 For the 2018-2019 school year, we received 2,209 applications for 240 seats. At BVP we believe college begins in kindergarten, so we work to foster a college prep culture from elementary through high school. One visit to our schools and you’ll notice the intentional elements we’ve incorporated into our environment to support our unyielding commitment to the belief that all children will one day graduate from college. For example, our students are referred to as “scholars” and identify with the year they will graduate from a four-­year college, rather than by grade level. Our homerooms are also named after our staffs’ alma maters, including URI, Brown University, Providence College, and other schools nationwide. More so, we take frequent field trips to colleges and universities starting as early as kindergarten. 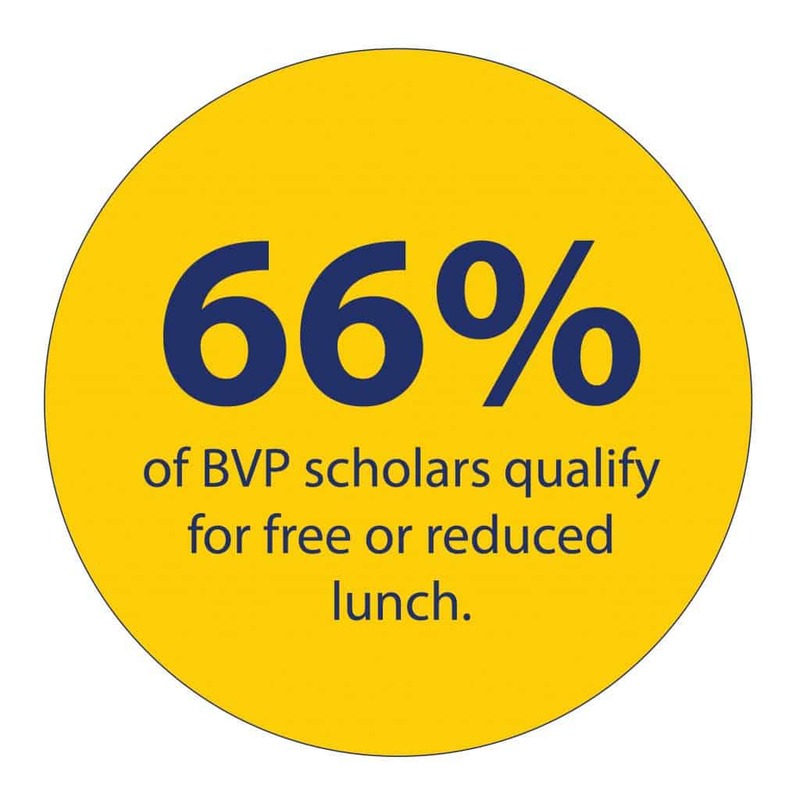 BVP is home to nearly 2,000 scholars and 280 teachers, leaders, and staff across 6 schools. BVP graduates its first class of college-bound scholars. BVP scholars score 108 points above the state average on the SAT. A permanent location for BVP High School is built. Middle School 2 is founded. The Rhode Island Department of Education named BVP High School and Elementary School 2 as Commended in February 2016 and Middle School 1 in October 2016. BVP High School adopts the Personalized Learning Platform via Summit Public School’s ongoing pilot program, Basecamp. Elementary School 3 is founded. Our 8th grade scholars scored 37 percentage points higher than the state average in mathematics on the NECAP assessment. BVP High School is founded. A permanent location for Elementary School 2 is built. Low­-income scholars attending BVP outperform non low-­income students attending traditional public schools in Rhode Island on the PARCC assessment. Elementary School 1 is named a Commended School by the Rhode Island Department of Education. BVP receives a 5 year charter renewal from the Rhode Island Department of Education. Elementary School 2 is founded. Middle School 1 is founded. BVP Elementary School 1 launches with 9 teachers, 2 full­time staff, and 76 kindergarteners. RI passes mayoral academy legislation, allowing for greater accountability and autonomy, including more opportunities for professional development. Apart from academics, we believe that preparing scholars for the world beyond also means experiencing the diversity of the world we live in today. By design, our network is intentionally diverse. We accept students from four unique sending districts: two from the traditionally higher-­income communities of Cumberland and Lincoln and two from the predominantly lower-­income communities of Central Falls and Pawtucket. Bringing together scholars from four neighboring communities allows us to create opportunities for them to share experiences, come together in classrooms, and connect across both racial and socioeconomic lines of difference. Valuing diversity is an organizational priority and a core belief shared across our network. This unique aspect of BVP has been noted both nationally and locally for promoting diversity. In a 2015 issue brief from The Century Foundation, Charters Without Borders, BVP is featured (starting on page 7) as one example of a way to leverage flexibility afforded to charters to focus on integration. BVP is also proud to be a founding member of the Diverse Charter Schools Coalition, a group dedicated to helping create diverse public charter schools through research, advocacy, and outreach. While just 22 percent of students in Cumberland and 29 percent of students Lincoln receive free or reduced-price lunch, 86 percent in Central Falls and 75 percent in Pawtucket do so. 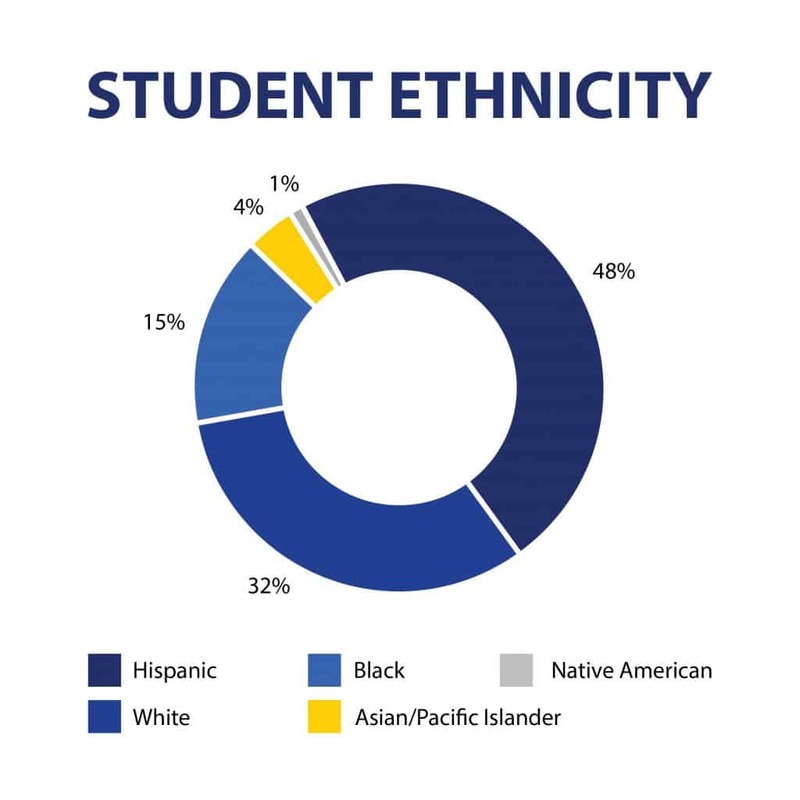 Racial demographics across the four school districts are similarly varied: Lincoln and Cumberland have student populations that are 80–90 percent white, whereas Central Falls is roughly 75 percent Latino, and Pawtucket’s student body is roughly one-third white, one-third Latino, and one-third black. Blackstone Valley Prep is committed to the academic success, social and emotional growth, and health and wellness of 100% of scholars in an intentionally diverse school that celebrates the racial, ethnic, socioeconomic, gender, and sexual-orientation differences of our scholars, staff, and families by actively engaging in courageous conversations about the value of people’s differences; raising awareness of self and society’s structural inequities; and empowering all people to engage in an open and honest dialogue with an active voice. At BVP, we believe in serving all children, including those requiring specialized services such as English Language Learners (ELL’s), those who need Special Education Programming, and children needing social and emotional support. For example, our Transitional Learning Center (TLC) supports the needs of scholars who struggle with social, emotional, and behavioral needs. Our team understands that one instructional approach does not suit every scholar and works to provide programming to meet the needs of every learner. In small classroom environments, teachers guide them on how to identify their feelings, utilize coping strategies, recognize the difference between appropriate and inappropriate behaviors, and how to self­-regulate. Teaching these strategies allows scholars to be successful when engaging in general classroom settings and allows them to thrive academically while also giving special attention to their social, emotional, and behavioral needs. Our school culture is founded on a core set of principles we call our PRIDE Values. We believe that by encouraging our scholars and staff to embody these values in their work and day-to-day lives, we are encouraging and supporting a firm foundation on which to build a successful career. P Perseverance: Never give up. Work as long and as hard as it takes to be successful. R Respect: I’m nice to you, be nice to me. Assume the best in those you interact with and be open to the opinions, perspectives, and styles of others. I Integrity: Always display honesty. Be authentic, take responsibility for the mistakes you have made, and speak honesty with one another. D Discipline: We do our best or do it again! Work hard and be focused on striving for high expectations. E Enthusiasm: Find the joy in your work! Be optimistic and anchor what you do in fun. Would you like to learn more about BVP’s school culture? Are you interested in learning more about Blackstone Valley Prep for your child? We host several Open Houses during our application window. Please complete the form below to receive the BVP newsletter.